This lakefront two bedroom cottage, is a perfect getaway for all occasions. The cottage has a large deck overlooking the lake, featuring four cushioned rocking chairs, propane fire table, dining area and lounge chairs. Walk down to the floating dock to fish, kayak or swim. We have two kayaks that guests may use. There is a small fenced in yard that provides great piece of mind with children. The interior features two bedrooms (One Queen bed and one Twin bed) and a pull out couch (Queen). One and a half renovated baths and a fully equipped renovated kitchen with breakfast bar. Kitchen, living room and sun room all overlook the lake. There are two LCD TV's with DVD players, charcoal and propane grills, corn hole, Keurig coffee machine, bottled water, board games, Wii, DVD collection, Cable, Internet, Giant Jenga, etc. Bed Linens and towels can be provided for a $30 fee per stay. When inquiring or booking our cottage please tell me a little bit about your party and that you would like linen service added. During the summer months there will be two air conditioners available. The cottage also has a wood stove and oil furnace for great year round use, perfect rental for ice fishing season as well. If you have questions about things to do in the area, please reach out, we are happy to help with recommendations! The cottage is utilized by both owners and renters, so a 48 hour notice is appreciated. Please note certain outdoor items will only be available spring, summer and fall months, items include: floating dock, kayaks, cushioned rocking chairs. We do have a sister cottage just three cottages down the lake if interested. Enjoy everything the lake has to offer swim, fish, and kayak right from the cottage's own dock. In the winter, enjoy ice fishing and ice skating when the lake freezes. 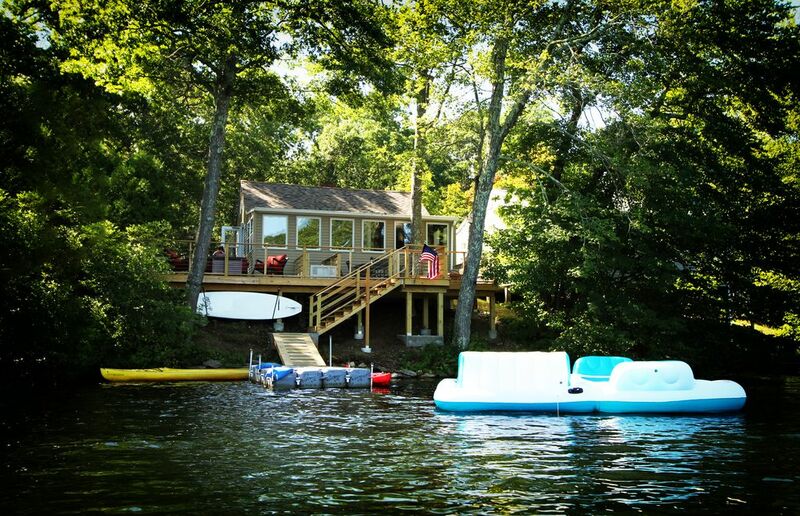 Year round waterfront fun! Propane fire table. Please remember to remove center metal grate. Wireless internet is now available! Thanks so much David for staying at our cottage, we hope you will visit again! The property was very nice and clean. The lake was peaceful and inviting; we swam and kayaked everyday and relaxed on the deck. The location was so close to Mystic and the aquarium. We had a great time! We stayed for a week visiting wineries,relaxing on the deck,kayaking. The cottage was a delight. It had all the comforts of home. We grilled each night and sat around the fire pit,and watched the stars. A great place to kick back,and not that far from home. The owners were a pleasure to work with. Thank you again. This was a perfect 3 day getaway. The house was very clean and had all of the necessities that we needed to make dinner, grill, etc. The toy chest and board games were much appreciated and added to our fun. Thanks for a great vacation! Perfect gateway for a few days. Very quiet, beautiful views, perfect for unplugging! Hosts are very flexible. We loved our time there. Located just 7 miles from downtown Mystic. 15 miles from the Rhode Island beaches. And only 2 miles to Foxwoods Resort Casino, Mohegan Sun Casino only 15 minutes away.